Last week, I managed to produce for myself some extra cash by selling a few items online. This led me to take a look at my Rig Building Checklist and what do you know, there is a component that falls right into the price range of the cash I have on hand. And this component was my Hard Drive. 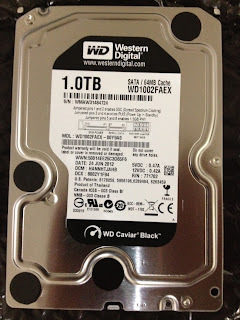 The Hard Drive I have selected is the Western Digital 1TB Black Caviar. This is a 3.5" Dual Processor Internal Hard Drive that spins at 7,200 RPM with 64MB of cache memory. 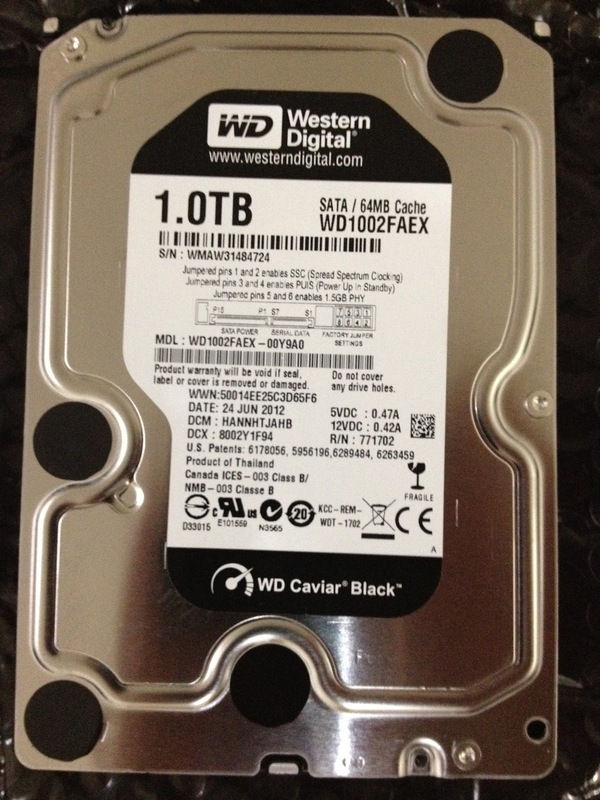 This model is 1 of the 3 Caviar series of Western Digital (The 3 models are Caviar Black, Caviar Blue and Caviar Green). So now, you may be asking yourself, "What's the difference between them all? ", don't worry, I've asked myself that question as well. Now I did some digging and I found some basic items that may answer your questions. The Caviar Black series is the top of the bunch (for the Caviar Series) in terms of power and performance. The Caviar Black has been optimized for performance but with this optimized performance comes higher power consumption and noise, however this noise may be negligible when it comes to overall Rig noise as it isn't the only component generating noise. The Caviar Blue is the marketed to be the perfect balance between power consumption and performance, spinning also at 7,200 RPM but has less cache memory than the Caviar Black and lastly, the Caviar Green is designed to be the most power efficient and quiet of the three at the expense of performance. The Caviar Green does not have a fixed speed as opposed to the Caviar Black and Blue, it runs on what Western Digital calls "IntelliPower" and based on my understanding, this means that the speed varies depending on drive usage and when not in use, the drive does not spin up thus saving power, did some research too and the speeds of the Caviar Green are in the range of 5,400-5,900 RPM. All three drives are SATA3 though. I chose the Caviar Black series simply because I didn't want to take any chances when it came to the overall performance of my system. Once I put everything together, we shall see how it performs. Thank you to my girlfriend for her endless support and patience, I love you! And thank you PCHub for my Hard Drive and for the great service!